In the overall spectrum of American Christianity, Congregationalism has, for better or worse, occupied a liberal place on the theological and cultural registers. This was especially the case from the mid-19th century onward, as, gradually but surely, churches and people began to shake loose the rigidities of their Calvinist, deterministic and pessimistic pasts. Emphasizing ethics and love over sin and fear, the “New Divinity” of the immediate antebellum period in New England made its mark in that region and places wherever New Englanders settled along the northern bounds of the U.S. The South, where an early attempt to re-create the orderly, conscientious culture of Puritanism dissipated into a slave-dependent economy and reactionary ideas about life and faith, would prove a very difficult place to plant a non-authoritarian variant of Christianity, given that the “Lost Cause” in the wake of the War Between the States would convince most people that theirs was a sacred society and that all others were defective at best and pagan at worst. 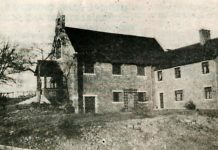 Working in such a paradoxical place, Central Church, which operated under several different monikers until settling on its present name around the turn of the century, provided a taste of the familiar to homesick Northerners, with a sober, restrained, yet gentle and joyful style of worship and mission. There were no protracted revivals or passionate denunciations of outsiders; orientation was definitely toward the cultivation of character and hospitality. While undergoing numerous changes, including a temporary division in the early 20th century, Central Church has remained in that mode for well nigh its entire history. 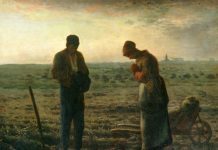 The Social Gospel, foreign to the spiritual sensibilities of most Southern churches, was not at all anathema to Central’s members. Withstanding a large “turnstile” membership and moves to a busy downtown intersection and later to suburban DeKalb County, the church has very much prospered over time and continues its fine tradition of service today through ministries to migrant workers in South Georgia; local schoolchildren; gays, lesbians, and the transgendered; and even the environment. Some 75 miles to the northeast in a small Georgia village that was home to what would in future years become Piedmont College, an Ohio-born Congregationalist minister formed a congregation at a meeting in the Women’s Christian Temperance Union hall. This group, known as the Union Congregational Church, was another reform-minded, theologically open fellowship in the mold of Northern churches. Piedmont College had a similar aim, to make into red-blooded Americans boys from the isolated hills of northern Georgia, to free them especially from the hold of liquor and marital infidelity. Since the church was never large, it sought a novel way to survive by forming a federation with the local Methodist church in 1947, uniting two organizations and two sets of auxiliaries under one pastor and one program, at one location. Today’s Methodist-Congregational Federated Church in Demorest, Georgia continues on this tradition of inclusion and social reform, albeit of a more moderate variety than some of their sister churches in the Southeast Conference. By the time of World War I, the conflict between Biblical inerrancy and Christian freedom was sharpening, dividing many traditional churches into two. In the case of Pilgrim Congregational Church in Chattanooga, Tennessee, a combination of moral reform and a local Methodist congregation’s hypocrisy in allowing a medicinal alcohol manufacturer to remain a member in good standing despite his profession spurred on that church’s founding in 1914. But “freedom of the pulpit” was another rallying cry that fell on deaf ears by Tennessee Methodists, and Charles Haven Myers refused to become a clergy victim, becoming instead Pilgrim’s first pastor. 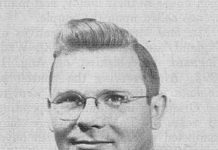 In later years, the church’s best-known pastor was an Englishman by the name of Arnold Slater, who served between 1944 and 1971. His firm yet gentle pulpit delivery and his strong social consciousness made Pilgrim into a leader among Congregational churches in the Southeast and liberal churches in the larger Chattanooga area. 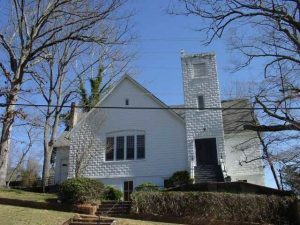 First located in downtown, the congregation moved to the foot of Missionary Ridge (itself named after the Cherokee missions by Congregationalists in the early 19th century) in the 1950s, where it remains today. In addition to being a generous contributor to Our Church’s Wider Mission (usually in the top five of church giving each year), Pilgrim has raised leaders for the Alabama-Tennessee Association and the Southeast Conference, names too numerous to point out here. Birmingham, Alabama, the steel-making capital of the South for much of its history, also experienced an influx of Northern-born businessmen and managers as Atlanta did. In 1903, some of them established today’s Pilgrim UCC, known as Pilgrim Congregational until the late 2000s. One early pastor, George Eaves, took a strong interest in the then-current epidemic of tuberculosis and helped found a local association to combat it, a forerunner of today’s American Lung Association. The early Pilgrim took a number of twists and turns, eventually gaining a large number of former members of First Presbyterian Church who were protesting their denomination’s hardline Southern Calvinism. By the 1940s, the church had a downtown edifice and some 500 members on the rolls. But structural issues with that building forced another move in 1959 to the lush suburb of Mountain Brook, with an A-frame construction that was so noteworthy that it made several magazine advertisements and was deemed “Blue Roof Church” due to the hue of the coating sprayed on the metallic cover. In the 1960s, the church experienced division over the Civil Rights Movement, but survived with a greater appreciation for the new UCC’s social action concerns. After a quarter century of theologically moderate pastorates and attempts to position itself as a socially prominent church, Pilgrim moved into a more progressive direction under the Rev. Richard Sales in the 1990s, and became the first Alabama UCC congregation to adopt the “Open and Affirming” platform in 2001. The aging of the 1950s structure caused the church to return to the city in 2007-08, first taking up space at Southside Baptist Church before renovating a former car dealership showroom floor in the Lakeview neighborhood. Today, although having a small membership, it is in the forefront of local and statewide activism for greater rights for all and an inclusive way of being church. 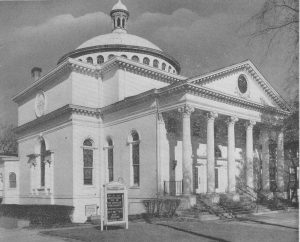 The last church to take a Congregational-like shape was founded right on the eve of the UCC merger. In late 1956, some members of Knoxville, Tennessee’s Second Presbyterian Church sought to forestall their congregation’s relocation from downtown to a plot west of the University of Tennessee campus. Failing to convince either congregational or presbytery leaders, they worked out an agreement whereby they could continue to worship in their beloved Gothic building—albeit in another denomination. Due to a number of factors, namely familiarity from previous associations, the Congregational Christian Churches was chosen. 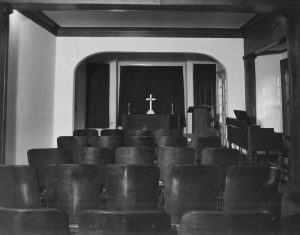 With a “ready- made” congregation, the First Congregational Church developed quickly into a leader of liberal theology and social action for a decidedly conservative center of Appalachia. However, the building eventually became a crippling burden due to maintenance, and the church, ironically enough, wound up leaving in 1968 for greener pastures in Western Knoxville. First setting up in an old stone house on a new piece of property, the church built a modern, all-in-one structure in 1972. Signaling that it was more or less a restart, the church took the name “Church of the Savior” at the instigation of pastor Donald Flick. Flick, and later John Lackey and current pastor John Bluth Gill, supervised a re-orientation toward service to the community, whether in traditional charity forms or advocacy for social justice, of which COS is second to none perhaps in all of East Tennessee. So strong have the justice commitments been that in 1984, rather than give into hysteria over AIDS by parents, the church decided to let go its child care center rather than expel the new fellowship of the Metropolitan Community Church of Knoxville from its premises, a highly unusual move of the time. The special COS brand of inclusion and witness has attracted strong congregational growth in recent years, approaching some 300 people. Christ, and the Christian religion in general. Most recently-established congregations among Euro-Americans in the UCC look to that model to follow in their common life, to be sure. But in a more triumphant vein, the six churches of the Liberal Congregational tradition in the Southeast Conference prove that, with strong leadership, vision, and determination, a pilgrimage can be made through anything—even the kudzu that covers the Southern ground. Harold L. Johnson et al., A Southern Pilgrimage: Central Congregational Church of Atlanta, Georgia, 1882-1982, ed. Robert C. McMath, Jr., 2-3. Sarah Gillespie Fenner, History of the Methodist-Congregational Federated Church of Demorest (Demorest, GA: 1989), 1. Kay Baker Gaston, A History of Pilgrim Congregational Church, United Church of Christ, Chattanooga, Tennessee on the Occasion of Its Seventy-fifth Anniversary, 1914-1989, 3. Frances T. Feazel, A History of the Pilgrim Congregational Church, United Church of Christ, 1903-2003 (Birmingham, 2003), 5. A Collection for Celebration 2003: The Past, Present, and Future (Nashville: Brookmeade Congregational Church of the United Church of Christ, 2003). Charles H. Faulkner, John R. Lackey, and John Bluth Gill, A Light Set on a Hill: The 50 Year Anniversary of the Church of the Savior (Knoxville, 2007), 2.